We’re finally going back to the Moon, but this time we’re going to stay. NASA’s got a whole new plan. It wants boots on the Moon in 10 years and on Mars in 20. Give or take. On Wednesday, the space agency announced its detailed National Space Exploration Plan to achieve the President’s lofty goals set out in his December 2017 Space Policy Directive-1. Those bold plans include: planning a new Moon landing, long-term human deployment on and around the Moon, reassertion of America’s leadership in space, strengthening private space companies, and figure out how to get American astronauts to the surface of Mars. Those smarties at NASA took that into account when detailing expected timelines for completing each goal in the 21-page report – from low Earth orbit (LEO), to cislunar space and then on Mars. That’s important because it means NASA will be able to incorporate what it learns along the way. Any claims – like the one published in NASA’s new report – that astronauts will stroll around on Mars by the 2030s has flexibility built in and could change if NASA researchers hit a snag or two in the process. For instance, NASA plans to wait until the results of the Mars 2020 mission, during which a rover will collect and analyze samples from Mars’ surface, before it will even begin to draft up a budget ask for the crewed mission that is slated for some time in the 2030s. 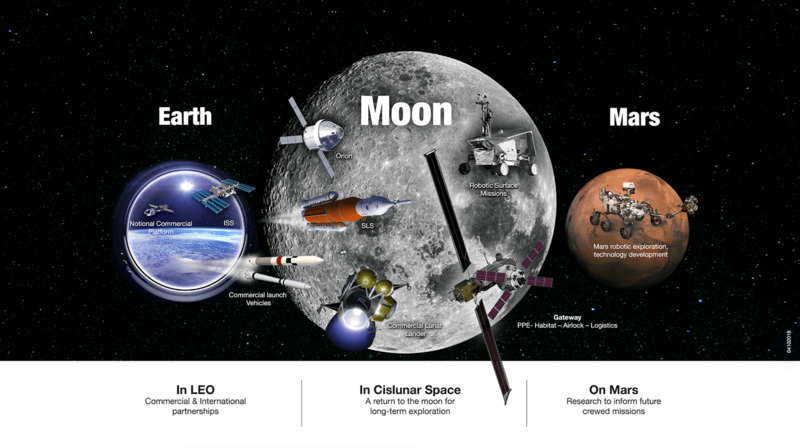 Once those satellites are in orbit, NASA hopes to use what it’s learned to put astronauts in lunar orbit by June 2022. These gaps in NASA’s proposed plans aren’t an accident – they represent key gaps in our understanding of space and interplanetary travel. Put another way: they represent the things NASA scientists want to learn. And if NASA sticks to this timeline, it will hopefully achieve it, which will guide us further into exploring space.